If you are a fan of Guillermo Del Toro, you will enjoy Mama, but not necessarily because he had anything to do with making the movie. Sure, his name is on the poster, but he did not direct, produce, or have any other creative input although it definitely has the look and feel of something he might have put together. That being said, director and co-writer Andrés Muschietti has created a movie that is truly creepy if not downright scary and Jessica Chastain shows she can handle things that go bump in the night just as easily as she can take down terrorists. 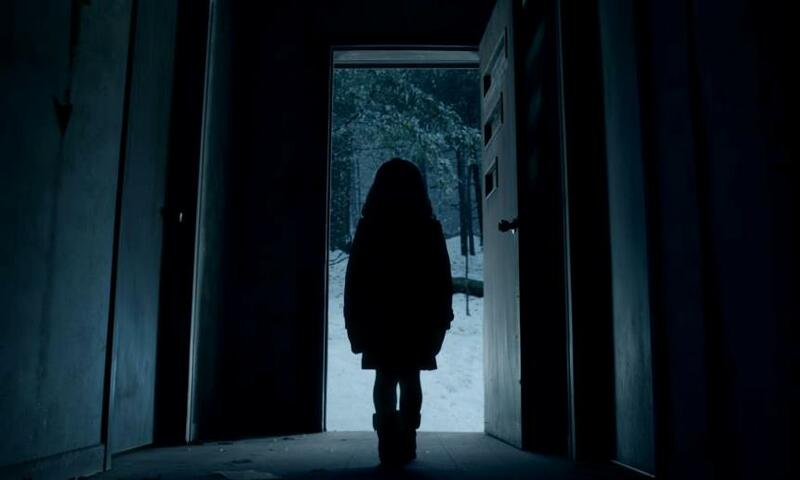 Victoria and Lilly are very young sisters who become stranded inside an abandoned cabin in the woods after their father displays some serious emotional issues by suddenly whisking them away from their home and then almost killing them all before mysteriously disappearing. A few years later, the girls are found by a search party that was organized by their uncle Lucas (Nikolaj Coster-Waldau) who had nearly exhausted every resource he had in hopes of finding his missing family members. 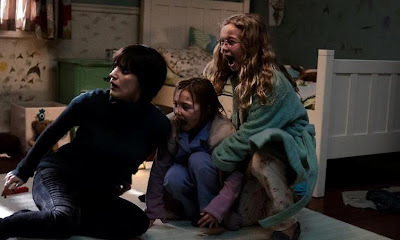 As Lucas and his girlfriend Annabel (Chastain) begin to help Victoria and Lilly readjust to civilization, it becomes clear there is something else going on as the standard strange noises and general creepiness begin to take over their house. The girls keep referring to a maternal figure who their psychiatric caregiver has determined is a fictional coping mechanism brought on by their ordeal. Of course, in a movie like this, the scientific explanation eventually goes out the window as supernatural events materialize into an actual threat that must be dealt with. What I liked most about this movie is how, while never really breaking any new ground story-wise, it also never felt overly familiar and had a genuinely creepy vibe to the point where the tension that was established early led to some truly scary moments. Its always interesting to see how new techniques and technologies can allow directors to put these types of movies on the screen and Muschietti does a great job of utilizing them to great effect. You also have to give him props for getting amazing performances out of the two girls that play the sisters as their unique character personalities are really what makes the movie work. Of course, having the unbelievably talented Jessica Chastain on board never hurts either and her mere presence adds a level of seriousness and credibility you don't normally get when it comes to the horror genre. It seems like every year there are more and more movies that attempt to scare the audience in different ways and now we even have sub genres that focus on things like torture and found footage as ways to draw in the crowds. Even with all the tricks, it is still rare to find a horror movie that tells a really good story while also being truly scary when its all said and done. 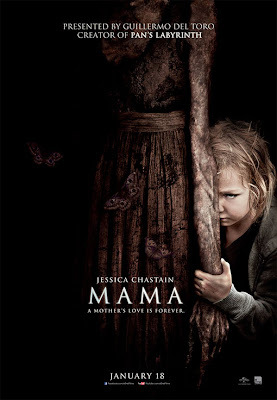 Mama definitely qualifies as one of the better examples I've seen over the last few years and gets the job done without having to use any cheap gimmicks or excessive blood splattering. While its not at the level of a movie like Pan's Labyrinth, I can definitely see why Guillermo Del Toro would want his name attached to this picture. Like any other good horror film it successfully creates suspense. An excellent acting by the crew makes it watchable. Visual effects are also very good. But the ending is too much dramatic. overall a good horror film.